, otherwise Vincenzo Maria Orsini, a Dominican friar, was a native of the kingdom of Naples, and the eldest son of the duke of Grayina. 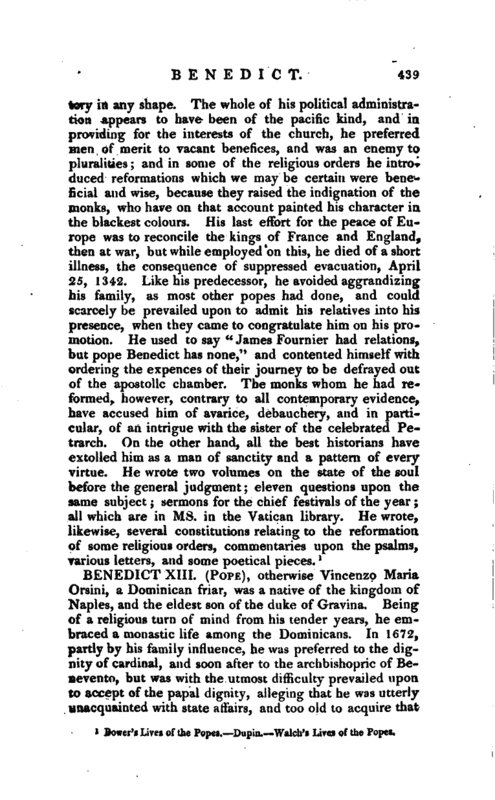 Being of a religious turn of mind from his tender years, he embraced a monastic life among the Dominicans, In 1672, partly by his t’amily influence, he was preferred to the dignity of cardinal, and soon after to the archbishopric of Benevento, but was with the utmost difficulty prevailed upon, to accept of the papal dignity, alleging that he was utterly unacquainted with state affairs, and too old to acquire that | species of knowledge. Being, however, obliged to acquiesce, he began with those measures which corresponded with his previous disposition, and the retired life he had led; reducing the pleasures and pomp of his court, suppressing abuses, and restraining the licentiousness of his clergy. With a view to these changes, he held a provincial synod in the Lateran in 1725, but the Jesuits, of which three were at this time cardinals, highly provoked at his approving the doctrine of the Dominicans, concerning grace and predestination, found means to render all his endeavours ineffectual. 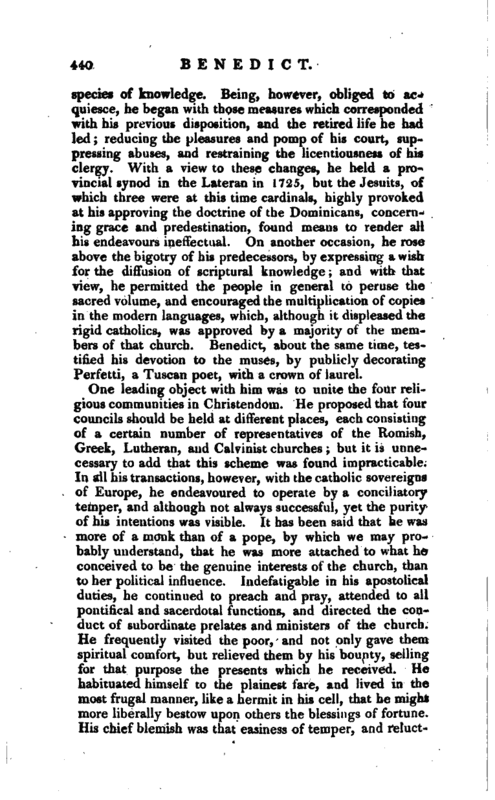 On another occasion, he rose above the bigotry of his predecessors, by expressing a wish for the diffusion of scriptural knowledge; and with that, view, he permitted the people in general to peruse the sacred volume, and encouraged the multiplication of copies in the modern languages, which, although it displeased the rigid catholics, was approved by a majority of the members of that church. Benedict, about the same time, testified his devotion to the muses, by publicly decorating Perfetti, a Tuscan poet, with a crown of laurel. 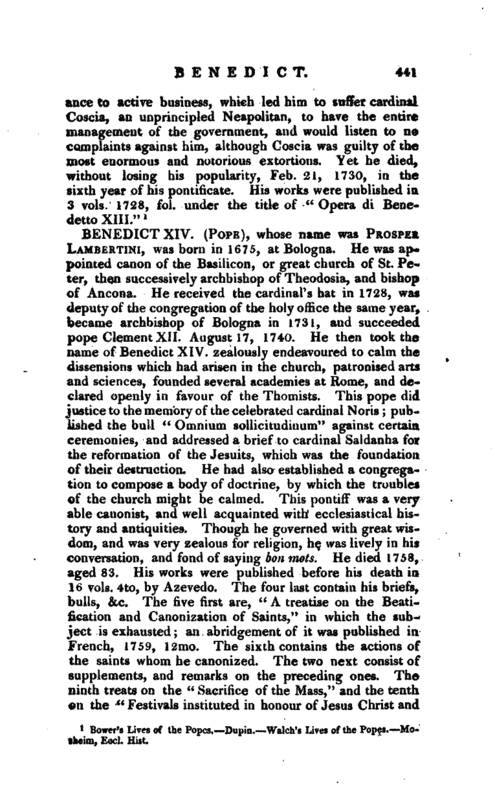 Bower’s Lives of the Popes.—Dupin.—Walch’s Lives of the Popes.—Mosheim, Eccl. Hist.